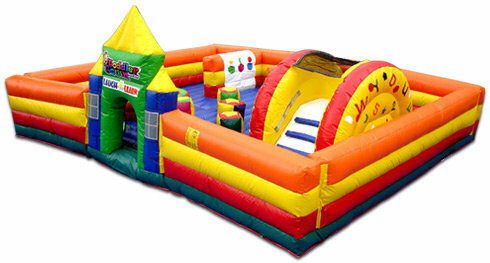 The Laugh N Learn inflatable play structure brings playtime and learning together in one exciting and colorful unit. A regal motif allows kids to enter through the center castle door where obstacles, a ball pond and a climb and slide await! Players can also choose to learn their numbers shapes, and ABCs in two different cubbies, or follow the numbered footprints along the play structure's big blue floor. Learning is everywhere in this adorable Laugh N Learn inflatable play structure, even numbers and letters adorn the arch of the no-jump climb and slide. Keep the younger ones safe and engaged in learning fun. Shapes, numbers and more are part of this large inflatable playground. This unit gives small children a fun and safe environment to learn and have fun at the same time. Great for the 5 year old and under age groups found in Nursery Schools, Day Cares, Churches, and more.